The Power Max 826 OE withToro Premium 252cc OHV 4-cycle engine provides proven power and performance to make your job easier in tough winter conditions. The innovative Quick Stick® control allows you to quickly and easily change chute direction AND chute deflector with a single, smooth motion. Convenient one-hand levers allow single-handed operation freeing the other hand to change speeds or the chute control without stopping. 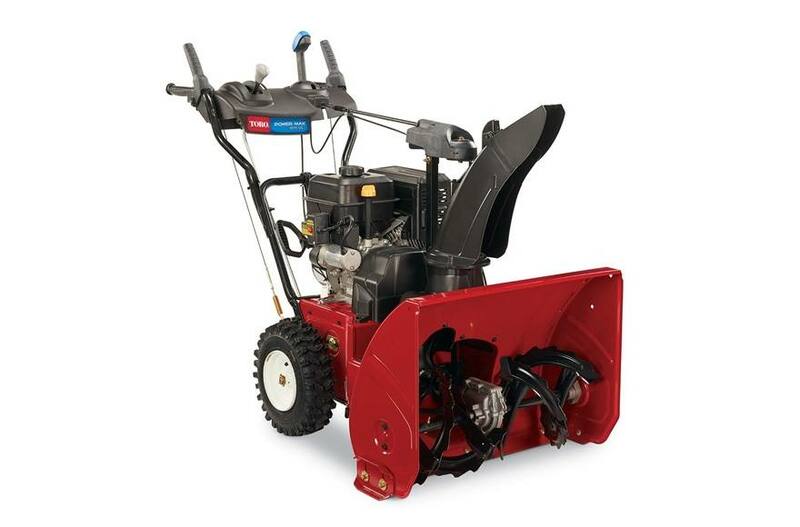 Power Max® Anti-Clogging System (ACS): A breakthrough in snowblowing technology, the Power Max® Anti-Clogging System (ACS) handles more snow in less time to get the job done fast! This revolutionary system regulates snow intake to virtually eliminate clogging while maximizing the impellor speed for powerful performance. Other snowblowers require the operator to manually limit snow intake to prevent clogging. Durable One-Piece Frame: Durability starts at it's core. The Power Max uses a solid, one-piece unibody frame for ultimate strength that's made out of the same thick steel as the commercial-grade Power Max HD. It has boxed auger housing supports for pushing into deep snow piles. Locking Control Handles: Convenient one-hand interlock system controls allow you to keep one hand free so you can adjust the chute without stopping. Sub Zero Material - Guaranteed For Life: Chute, deflector and ACS are made of a special cold-weather material durable to -104? F and guaranteed for life. It is also rust-free, so there’s no binding, and snow and ice won't stick. Drift Breaker: Knocks down large drifts, allowing auger to collect and throw deep snow. Available as an option on all Toro two stage snowthrowers. Tire Chains: Provide additional traction in slippery conditions. Available as an option on all Toro two stage snowthrowers. Heavy-Duty Cast Iron Skids: Designed to be .5" thick for maximum life. The added weight on the front helps to chew through deep snow piles. Reversible for double the life. Non-Marking Poly Skids: Protect your driveway and sidewalk surfaces by using these non-marking poly skids. Reversible for double the life.